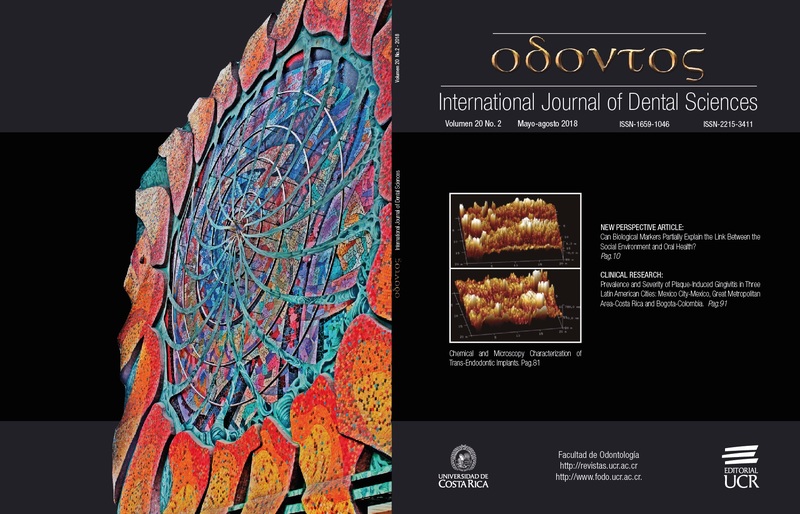 Odovtos – International Journal of Dental Sciences (Odovtos-Int J Dent Sc) is the official scientific publication of the Faculty of Dentistry, University of Costa Rica. The main objective of this peer-reviewed journal is to disseminate original and transcendental knowledge in the field of dentistry and its specialties. Our journal consider unpublished and original manuscripts with a prominent focus on critical and innovative data, promoting major clinical, academic and scientific research, based on International Committee of Medical Journal Editors (ICMJE) recommendations. 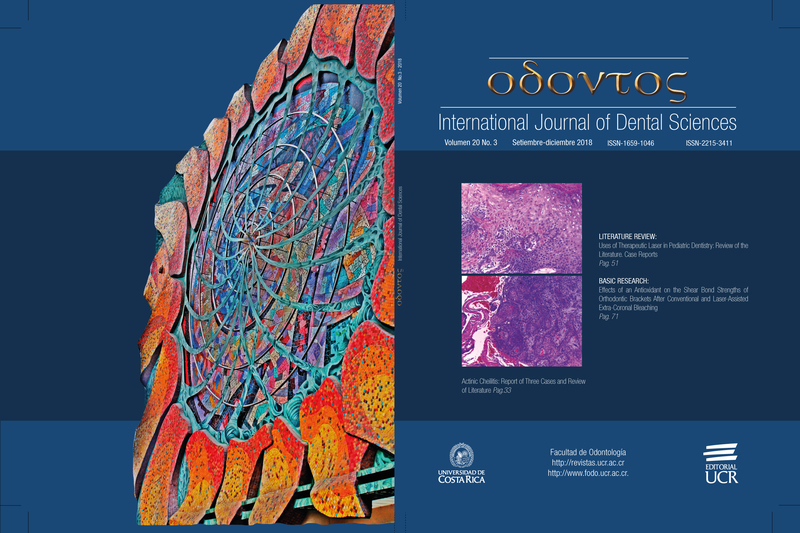 Odovtos - Int J Dent Sc offers Online-First publication, allowing frequent dissemination of its content. WHY SUBMIT YOUR PAPER TO OUR JOURNAL? 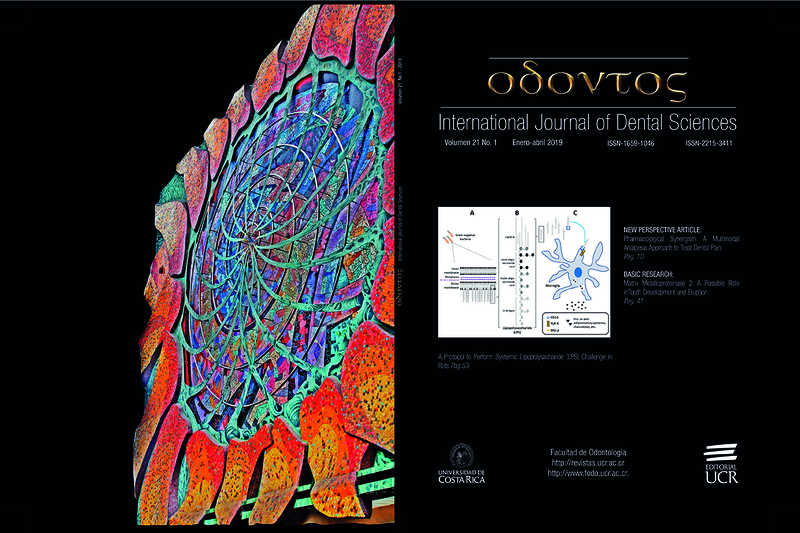 Odovtos – International Journal of Dental Sciences compromises to disseminate their contents worldwide, through collaborations with several Dental Schools, online databases, index and repositories, website, social media, among others. All submitted manuscripts are peer-reviewed based solely on the criteria of quality, innovation and pertinence. The pre-publication process is brief due to online submission. Moreover, Odovtos-Int. J. Dent. Sc. is an Online-First Journal, which allows frequent publication in Internet according to Open Access Initiative, favoring the diffusion of its content. Odovtos International Journal of Dental Sciences has a strong commitment to disseminate critical and innovative data, promoting major clinical, academic and scientific research worldwide. Thus, one of our main goals is to encourage authors to publish in solely in English to improve the visibility and international impact of the articles. We are working in order to obtain an essential collaboration with a professional english editing service to ensure the quality of our publication. Gradually, our journal will give an special attention to promote with authors, editors and readers the modifications required. This type of goals corrobates Odovtos - Int. J. Dent. Sc commitment with our academic and scientific community. Pachas Vásquez DDS A., Suárez Ponce DDS, MSc, PhD D., Evaristo Chiyong DDS, MSc, PhD T.
Atay DDS, PhD A., Palazli DDS Z., Gürdal DDS I., Üşümez DDS, PhD A.
Ramírez Barrantes DDS, MSD, PhD J.
Aguilera-Galaviz MSc, PhD L., Hernández-Vázquez DDS B., Frausto-Esparza DDS S., Díaz-Rosas DDS, MSc C., Gaitán-Fonseca MSc, PhD C.
Vasconcelos Monteiro DDS, MS, PhD Studen R., Cavalcanti Taguchi DDS, MS, PhD Student C., Gondo Machado DDS, MS, PhD R., Batalha Silva DDS, MS, PhD S., Karina Bernardon DDS, MS, PhD J., Monteiro Junior DDS, MS, PhD S.
Pomacóndor-Hernández DDS, MSc, PhD C., Hernandes da Fonseca DDS, MSc, PhD N.
Does Sterilization Affect the Push Out Bond Strength of Experimental Dentin Posts? Tulga DDS, PhD A., Ayşe Şanal DDS, PhD F., Ömür Dede DDS, PhD D.
Zúñiga-Castañeda DDS, MSc R., Ortiz-Magdaleno DDS, MSc, PhD M., Uribe-Trancoso DDS R., Goldaracena-Azuara DDS, MSc M., Romo-Ramírez DDS, MSc G.
Boza Oreamuno DDS, MSc Y., Evans Tinoco DMD, OPH M., Guillén Colombari DMD, Path D., Torres Labardini DDS, OMS R.